Here, at Pato Blanco RV Resort, we bend over backwards to make your stay as peaceful and relaxing as possible from our pool and hot tub, your peace is our top priority. 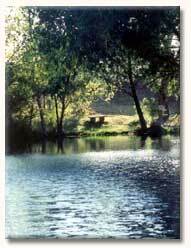 The clean fresh air and mild climate complement the three artesian fed lakes, as does the peaceful park like setting. Pato Blanco RV Resort is an ideal home for a myriad of native bird and waterfowl species which provides excellent opportunities for bird watching and a perfect setting for the numerous trails that weave throughout the park. During your evening walk, feel free to stroll by the lakes and see the birds flutter through the trees and skip across the lake in the light of the setting sun; it's always beautiful and peaceful afternoons here at Pato Blanco RV Resort. Would you like to buy a model? Or rent a space year round?